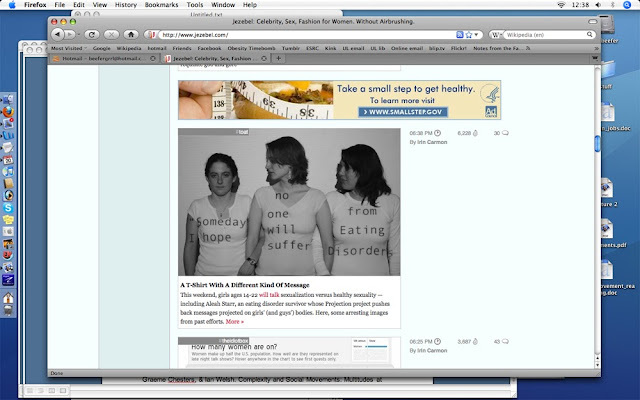 I like how this screengrab I took from Jezebel.com today illustrates some of the contradictions and tensions in talking about fat. Yeah, that's my desktop. An article about a critical grassroots campaign about eating disorders is capped off with a diet advert. The diet ad is framed as a 'health' intervention, but it uses the visual cliché of a tape-measure around food that is being presented here as 'unhealthy' – a burger, classic visual shorthand for out of control eating/root cause of obesity – and thus in need of control. It looks like an official US government intervention, I didn't click on the banner so I don't know. Given the sponsorship of such campaigns by weight loss corporations, it can hardly be considered a neutral public service announcement, even though it masquerades as one. Now I think the relationship between eating disorders and diet culture is complex and I don't subscribe to the simplistic conclusion that dieting causes eating disorders. But I do think that diet culture is unhelpful in terms of eating disorder recovery, and of people feeling ok about themselves in general, and I see dieting as it is presented here as a form of disordered eating in itself. On the one hand Jezebel is taking the laudable position of supporting campaigns that help people with eating disorders, which I think is related to fat activism, but on the other it profits from diet culture. I don't think this is deliberate, I think Jezebel's editors are interested in helping develop critical responses to fat, 'obesity' and also eating disorders and the kind of body stuff that affects women. Sometimes they're right on the money, and sometimes I think their analysis is a bit sketchy, but this is to be expected from a populist site, I think they do pretty well considering. I've mentioned these kinds of banner adverts before to Jezebel and they've sent me apologetic responses and promises to do something about what they too see as a problem. Meanwhile these adverts persist. I don't know much about how internet advertising works, but I suspect the adverts I'm seeing are provided by a third-party ad-server and reflect my nationality, based on my IP address, and possibly my presumed interests, eg based on the things I click on. It's likely that the adverts you see will be different. Because weight loss is such a perfectly-formed consumerist product, it makes sense that these are the ads that appear above an article about eating disorders. There's no equivalent advert for fat lib right now, though there may be in the future and that will also be problematic. I don't know how much say Jezebel's editors have in deciding what kind of adverts appear on their site, perhaps very little. The content on Jezebel.com is also contingent on the business requirements of the parent company, and its context within an online marketplace. What interests me is the inconsistency of the message from Jezebel, how this is likely out of the editors' control, and thus how difficult it is to produce strong, ongoing analyses of fat embodiment within popular culture without being undermined by wider economic-political systems. 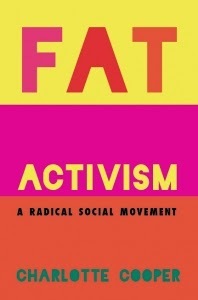 It suggests an explanation about why fat activism is also an inconsistent social movement. 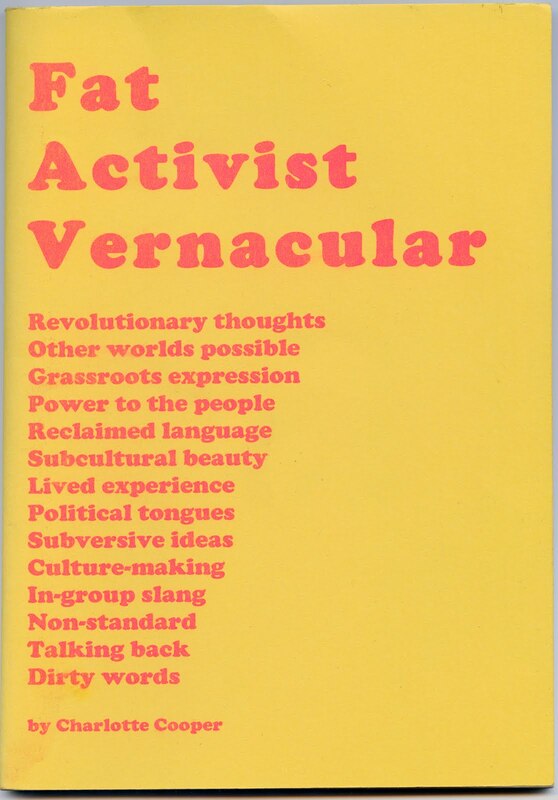 In many ways I think this is good and right, it's pluralist rather than monolithic which means that it can be relevant to a lot of people. Yet I still yearn for consistency; clear, straightforward ideas that help people feel better and help me make sense of things. I think this might be wishful thinking and it's possible I might be happier if I could embrace the chaos a little more. Pluralism has its downsides for all but small activist groups because focus and interests in larger groups are diffuse, and the power to effect change is consequently diluted. Diversity and individual differences as reflected by philosophical pluralism are surely to be fostered, but political pluralism, while beneficial to democracy overall, pays no heed to the unequal power of individuals. The most strident advocates of pluralism champion the real benefits but assume we all have equal access and agency to affect change - and that is clearly absurd. I'm certainly not anti-pluralism. I guess I'm just saying that even diversity, which is clearly of benefit to capitalism (and us in different ways), is counterproductive to all but the most powerful of interest groups and is used by big business as a tool - 'organised outflanking' - to counter protest and resistance. Lots of ideas can be generated by diverse voices, but unless there is organisation of some sort, only chaotic noise will be the result. My opinion only. I'm not sure why I wrote this. I'm not sure of much anymore. Damn advertising. It's usually keyword generated, so all the fat/weight/body/ keywords just draw those ads right to these kind of posts. I'm plagued with them on Wordpress, but at least it's easy to advise readers to just create a free account and they won't see them once they're logged in. Not sure how they work on sites with advertising plugins. I guess we just report those where we can and hope the site admin can and will take some action against them. LighterLife: was Lucy Prince a casualty?